It is easy to get on and off the Twinny tandem. This is down to the spacious low step through. It is designed with more space between the saddle of the front rider and the handle of the co-rider, thus avoiding the two riders sitting too close to each other. You can also pedal independently of each other using the double free wheel. The optional switch-able free wheel can be used to determine whether and how the passenger pedals. Many options are available for this cycle, including a detachable variant. You may even opt for a steering handle to be assembled at the rear. As every bike is produced uniquely, you can get the frame height adjusted in front and at the back as per your requirement. 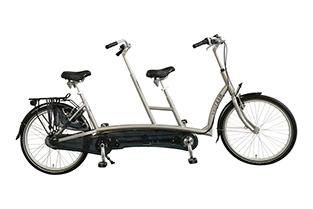 An electric engine can be used for a comfortable power assist to make cycling on this tandem much easier!